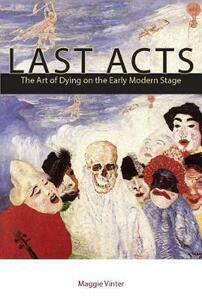 Last Acts argues that the Elizabethan and Jacobean theater offered playwrights, actors, and audiences important opportunities to practice arts of dying. Psychoanalytic and new historicist scholars have exhaustively documented the methods that early modern dramatic texts and performances use to memorialize the dead, at times even asserting that theater itself constitutes a form of mourning. But early modern plays also engage with devotional traditions that understand death less as an occasion for suffering or grief than as an action to be performed, well or badly. Active deaths belie narratives of helplessness and loss through which mortality is too often read and instead suggest how marginalized and constrained subjects might participate in the political, social, and economic management of life. Some early modern strategies for dying resonate with descriptions of politicized biological life in the recent work of Giorgio Agamben and Roberto Esposito, or with ecclesiastical forms. Yet the art of dying is not solely a discipline imposed upon recalcitrant subjects. Since it offers suffering individuals a way to enact their deaths on their own terms, it discloses both political and dramatic action in their most minimal manifestations. Rather than mournfully marking what we cannot recover, the practice of dying reveals what we can do, even in death. By analyzing representations of dying in plays by Marlowe, Shakespeare, and Jonson, alongside devotional texts and contemporary biopolitical theory, Last Acts shows how theater reflects, enables, and contests the politicization of life and death.